Paul C. is a native of Indianapolis, Indiana. After graduating High School in the mid 1970’s, Paul steady worked steadily in Construction over the next 10 years, then as a Painter for 9 years and finally had a plumbing business which he maintained for 10 years. During this time, he moved to Atlanta where he and his wife raised 8 children. staying at the Atlanta Union Mission where one afternoon he passed out. Next thing he knew, he woke up at Grady Hospital. 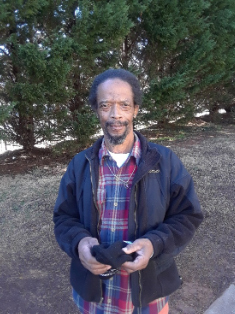 After having to visit the emergency room on multiple occasions to determine what was occurring, he was subsequently referred by Social Services to the United Way and Homes of Light Hospital to Home program. Paul says that his time at HOL has allowed him to get both his mental and physical health back and to obtain stable housing. He looks forward to moving into a Senior High-Rise facility soon. Paul enjoys spending time with his family including his 21 grandchildren and 3 great-grandchildren which are his pride and joy. Being homeless has reminded him of the ‘importance of being humble’.